On Wednesday 24th May the school had a very special visit from EU official Mr Jan Salko -who had travelled from Slovakia- and Miss Fionnuala Flynn of Global Schools. The visit was to evaluate the Global Schools exchange program which Principal Johnny Tyndall is taking part in. They were given a tour of the school and a brief history. Mr Salko was also brought to see the mural the children had painted at SuperValu in Skerries. 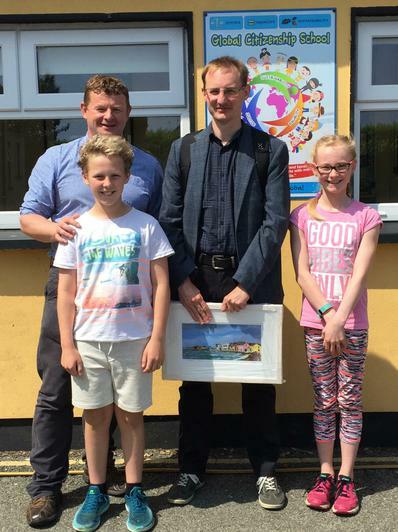 Mr Tyndall and some of the children presented Mr Salko with a picture of Skerries to commemorate his visit.